From my memory the GULAG was abolished, because it was not economical. The prison guards cost much more than the inmates produced and were corrupt as a rule. Yet, for decades, we can read about the rising US prison population and measures similar to the GULAG being tried, that is, using prisoners as a source of cheap labor. Why did the US prison system not implode similarly as the GULAG system did, over the decades, due to unsustainable costs? In reality, a consistent theme throughout the Gulag archives is that the Gulag system cost more than it produced and that it was creating a class of professional criminals. From the common sense perspective, the GULAG was destroying its workforce (prisoners) and hence can be regarded as uneconomical simply because of that, but the US system is not much better, a jailed intellectual doing menial work can be viewed as a wasted resource as well. The same goes for jailed young people who cannot develop professionally as a consequence of incarceration. Comparing the US prison system to the GULAGs is going to give you more differences than similarities. For example, Aleksandr Solzhenitsyn was sent to 11 years in the Gulag for complaining about how Stalin was handling WWII in personal letters that he wrote to his friend. Even the Russian Times (a known English language propaganda site for Russia) admits that the gulags were instruments of terror. The Gulag reached its peak after 1929 during the rule of Joseph Stalin , who used it to maintain the Soviet state by keeping its populace in a constant state of terror. The US prison system has its problems but its purpose and use are fundamentally different form that of the gulags. The gulags punished criminals as well as people who disagreed with the Government/Communist philosophy. And this doesn't even cover the horrible ways Gulag inmates were treated as opposed to US prisons (which are themselves not pleasant places). The Gulag was uneconomical (didn't make a profit), Like wise the US prison system is uneconomical, Why doesn't the US prison likewise fall apart? well because it exists for a different (and in the Eyes of the people of the US) legitimate reasons. Punishing criminals (men who do others harm) and keeping criminals off the street so that they can not continue to commit crimes. Technically, the gulag might have been abolished but the current Russian penitentiary system, the FSIN, retains the same spirit and the same sort attitude to inmates. They no longer intentionally try to kill the inmates off by hard labour, untreated illness, and frostbite, that much is true. They still don't give a damn, though, if that's what happens. More to the point, while the gulag might have been uneconomical in the proper sense, it enabled Stalin to accomplish a number of megalomaniac projects (e.g. the BAM). So as far as Stalin was concerned, he was getting things done, no matter what the cost. Likewise, the decision to close the gulag and to abolish the most atrocious practices was based on the general softening of the regime after Stalin's death, not on an economic calculation. The comparison between the soviet gulag system and US prison system would have to be made on % population confined. I’ve seen no numbers on that, nor did you provide numbers, other comparisons such as economic would fail to compare. I agree with Danny's answer, except about the economics. Economics had nothing to do with the ending of the Gulag system. Purely from an economic standpoint, the Gulags were pretty solid. Profit isn't the right word because gulags were run by the state, but as for economic benefits of the gulag systems for the state, they were well beyond significant. Right before the war, Gulags provided 46.5% of the nation's nickel, 76% of its tin, 40% of its cobalt, 40.5% of its chrome-iron ore, 60% of its gold, and 25.3% of its timber. So Gulag's weren't merely a significant part of the Soviet Economy in the 30's, 40's and early 50's. They were the economy. The Soviet Union was dependent upon them for the materials which made the rest of the economy go. Why did they end? Lenin had started the Gulag system, and Stalin had expanded it. They ended mainly because Stalin died (March 1953) and the new Soviet Leader denounced him and his practices. Stalin was after all a larger mass murder than was Adolf Hitler and the Soviet Leadership which survived him knew it better than anybody else. The Gulag's ended as prisons for criminals in the early 50's. The release of political prisoners started in 1954 and became widespread after Nikita Khrushchev's denunciation of Stalinism in his Secret Speech at the 20th Congress of the CPSU in February 1956. 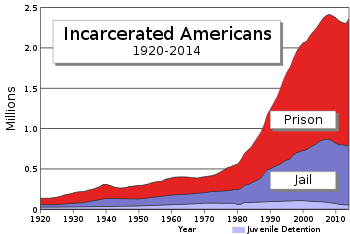 It is true that some US states have a history of for profit prisons. But the prisoner's offenses, death rates, economic benefits of confinement, and overall national reliance on those piece meal institutions can't be compared with the discredited Soviet era death camps for mostly political prisoners. The Russian historian Golfo Alexopoulos said in 2017 that at least 6 million people died in the Soviet gulags which put's just Stalin's gulags on pare with Hitler's final solution. Not the answer you're looking for? Browse other questions tagged united-states soviet-union or ask your own question. Why did the states that were born out of the Louisiana purchase adopt a common law system, and not a civil law system? How Did The US Justice System Lose Sight of Intent? How did the United States penal system evolve? In what ways were the creators of the USA's system of government inspired by Roman government? Did “loan sharks” arise after debtors' prison was eliminated? Was it ever possible to join the US military instead of going to prison for a crime? What was the content of Solzhenitsyn's critique of the West?